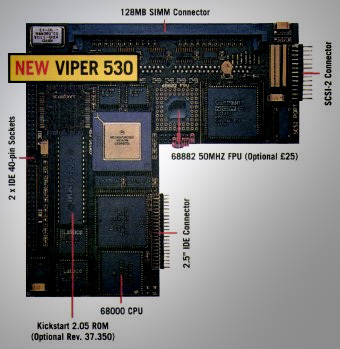 NOTE: The EMatrix 530 which was at least sold in Poland, appears to be the same card as the Viper 530. 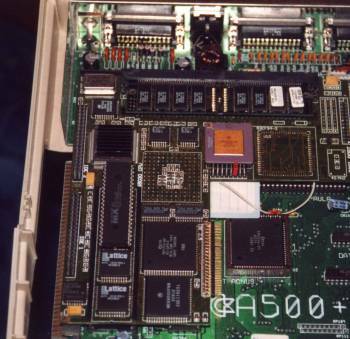 Processor: 030@40MHz or 030@50MHz - PGA or QFP 68000@7.14MHz PLCC - onboard, avaible when you disable the board, for retro-compatibility. or one drive on "IDE 2.5" with one drive "IDE1". exceed two in any case. You must set the correct master/slave combination in the devices. you can connect to the E-Matrix! 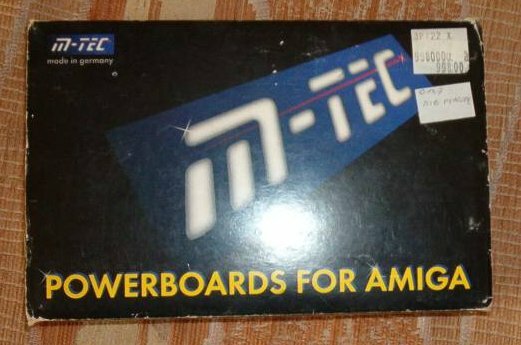 this is the minimum for the turboboard. damage or crash to the system. Near the SIMM socket there are the same pin for the second optional socket. IDE OFF   Close the jumper for E-Matrix Kickrom, open for use the onboard Kickrom. All combination of ROMs are possible: 1.3, 2.05, 3.0, 3.1, etc. (for IDE a better 2.05 ROM is required). HDD LED   NEVER put a jumper! Connect HDD LED for IDE/SCSI activity. A 19-A 20 Connect the Mini Megi Chip (2MB RAM Chip) if you have one.